I’ve been planning a trip to Zimbabwe (for Gordon Institute of Business Science or GIBS) for the last two months. Well, there wasn’t much planning involved other than the many discussions before the trip actually happened. For those that are not informed about Zimbabwe; it is a country lead by a dictatorial leader that’s been in power for the last 26+ years. The last elections, about two weeks go, did not go without the usual irregularities as seen in countries run by dictators. The result is that all my business colleagues, friends and family were warning me that it is not a good time to go. So, the way I figured this blog needs to be written, while sitting in airport waiting to depart for Harare, is to give you a view on my thinking and then on my return to provide some feedback. I’m the eternal optimist; but I also get affected by constant bombardment of negative messages in mass market media (The Zimbabwe Effect). CNN, Sky, CNBC, etc all have provided a pretty gloomy picture of Zim and its current practices and situation. Is there something else happening in this country that we don’t know about? My day tomorrow is with twelve bankers from a bank in Zimbabwe (with people from the region), and the topic is Innovation and Creativity in Banking. Africa is filled with people needing access to credit and other financial products, and yet the uptake of the unbanked is still pretty low. Social banking models â€œinventedâ€ in the first world have been in practice in this market for a long time. The concept of stokvel and community lending models have kept communities functioning. Much has been written about Grameen bank and their ability to capture the “bottom of the pyramid”. Arriving at Harare Airport at 9pm on the 14th got me thinking about the dangers… Yet, I felt safer than arriving at O.R. Tambo (Johannesburg International Airport). The people are friendly and helpful and very chatty about the Zimbabwe situation. My driver was very informative as he explained that the people are disappointed about the current affairs and especially about Mbeki’s (south Africa’s president) comments about “What crisis?” – although I could understand why he would say that seeing that things are calm and orderly on the surface with police marching everywhere. Driving through the streets of Harare, clean and deserted, reminded me of what towns (in South Africa) looked like as a kid. I think that these well preserved 60-70’s style architectures have worked well for Africa. 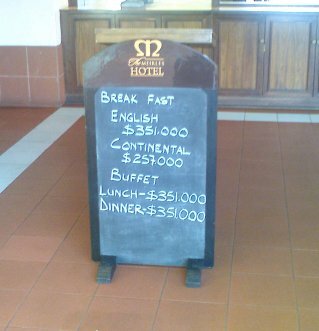 Breakfast was paid for with Zim$351,000,000.00 or about US$5.00. The picture does not show the last three 0’s as there is no space… The quality of the picture is also not up to scratch – I used my cell phone’s camera. Journalists have been removed and jailed before for taking pictures. Throughout the day we heard fighter jets pass by and at one point heard some people making a noise in the streets below. 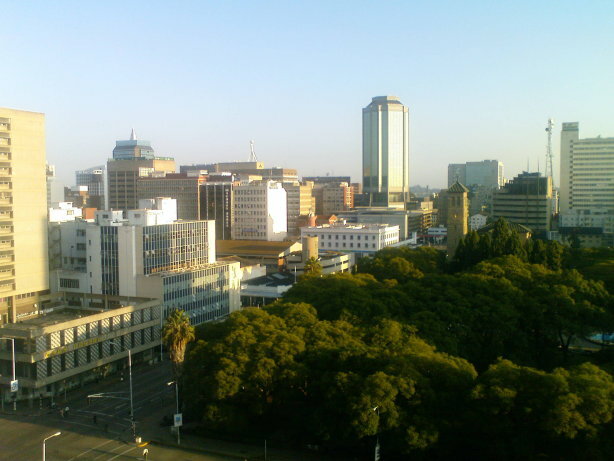 The presence of police calmed things down and Harare was back to business as normal. Today was also a stay-away strike day in protest to the elections results not being communicated, so it was a particularly quiet day. There were not many cars on the roads and you saw people on foot working their way home as no public transport was operational. I was reminded that the country had people that are calm… Zimbabwean’s know that the “old man” (a term used by many Zim people when talking about Robert Mugabe) needs to move onto retirement. He needs to hand over his reign to someone that will affect change and focus on economic reconstruction.